Offering you a complete choice of products which include digital anti-theft security pos stand tablet ipad air2, mini4, galaxy tab, note 10.1, 7-10-inch tab, desktop pos tablet kiosks display stand secure lockable, desktop anti tamper theft stand pos lenovo tab 4 10 kiosk tb-8504 enclosure lock & key, desktop anti tamper theft lockable stand pos ipad air, air2 tablet kiosk enclosure lock & key secure, desktop anti tamper theft lockable stand pos lenovo tab 3 8 8" kiosk enclosure lock & key and apple ipad air tablet desk mounted secure stand anti theft. Application POS education, health-care, KIOSK, corporate, retail and point of sale environments. Tablet kiosks are popping up around the world as restaurants explore innovative new ways to provide superior customer service. Secure tablet kiosks are used in restaurants as digital menus, loyalty card stations, table-side and catering orders, social media engagement and self-service payment terminals. Self-service tablet kiosks help restaurants entertain and engage customers using tablets in fun and innovative ways, providing new outlets to ensure total dining satisfaction. Here are the Top Five tablet kiosk trends in restaurants. Tablets secured in iPad Kiosks can be used by retailers to present special offers or promotions that will boost sales. ANTI-THEFT FOR PUBLIC ACCESS – This Lenovo Tab 4 10 table mount will keep your device secure while the public uses it to complete transactions or to find information. EASY TO USE AND ADJUST – The full motion design of this Lenovo Tab 4 10 kiosk allows the user to adjust it to a comfortable viewing position both in landscape or portrait angles. UNIVERSAL FIT – This Lenovo Tab 4 10 POS stand will also fit a variety of tablets that have a screen size of 10.1 inches. HEAVY DUTY DESIGN – The heavy duty design adds extra security to this tablet anti-theft stand, so your mind can be at ease while you are busy working. The Lenovo Tab 4 10 Floor Stand is a highly versatile product ideal for clients looking to provide interaction with their products and services through a free-standing anti theft tablet enclosure. This stand is tough; constructed of high-grade steel with a White glossy powder-coat finish that is scratch-resistant and easy to clean. Compatible with Lenovo Tab 4 10 only 10.1" tablet Simple and sophisticated, the Tab 4 10 metal Floor Stand has very elegant and clean surface lines with that make it adaptable to just about any environment. A simple yet highly functional pivot joint behind the enclosure provides wide panning and rotation capabilities. This allows users to view the tablet in a multitude of aspects. The Floor Stand utilizes a standard mounting system, giving users flexibility to mix and match the enclosure and stand with other compatible products. Each tablet Floor Stand enclosure comes pre-installed with a pick-resistant, tubular pin lock, to keep your tablet safe and secure while in use. Charging devices can be a nuisance. The cable management system allows the tablet power cable to remain connected to power but concealed from the public eye. Assembling the Floor Stand is a breeze. The limited number of parts and tools required make the average assembly time less than 5 minutes. Application designed specifically for tradeshows,events,and retail environments. 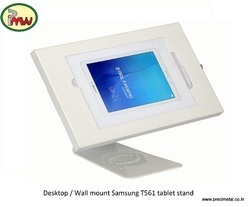 Safely and securely place your tablet on display. The anti-theft tablet stand is adjustable and fits tablets up to 10.2'' inches tall and 7.4'' inches wide (Works with iPads, Kindle, Galaxy, Samsung, Android Tablets, etc.). Rest assured with regard to the safety of your device when you install the unit in public areas. Allow convenient access to your tablet when installed in high traffic areas like front desks, lobbies, customer counters or on showroom floors. The includes an internal cable management system and tamper-proof locking mechanism, with included key, to add an extra line of safety. The kit includes all necessary mounting hardware and brackets for a professional and clean installation. Compatible with iPad Generations 2, 3, 4, iPad Air and iPad Air 2. *Designed for tablet screens larger than 8.7'' x 6.3''. secure and lockable metal Ipad enclosure. The Portable Fixed Desk / Table Top Stand is elegant, secure and sturdy. The fixed angle makes viewing and interacting with the kiosk comfortable and convenient for all users. The durable hinged welding construction ensures you kiosk will last. The Base Piece allows for this stand to be portable and free standing on any table, desk top or countertop. The non-slip pads (optional) at the bottom ensure that the stand will stay in place while in use. Ideal for those who need a fast set-up for tradeshows or other displays. Our PMW I32 Tablet Enclosures are designed & engineered with attention to details like a tablet protecting pads for tablet protection, and a power button service knockout. Our enclosure fully wraps your iPad or Android tablet for ultimate protection and theft prevention. 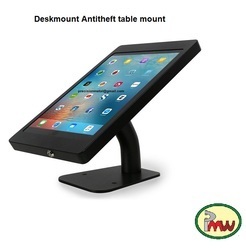 The PMW Portable Fixed iPad / Tablet Desk, Table Top Stand is a secure, refined and polished tablet kiosk. Once assembled, it is as simple as placing the tablet cover on top of a surface and the tablet kiosk is ready to use - may we say it is "installation independent". It is perfect for Point-of-sale (PoS) setups, retail display environments, client sign-ins, trade show exhibitions, or even public events. The addiontial Kensington lock makes certain that the Kiosk is secure. This stand can easily withstand the high traffic abuse of typical kiosk environments. Cables are easily hidden through the stand's hollow chamber for a clean look. All of these attributes allow for a portable yet secure tablet kiosk with long term aesthetic appeal. 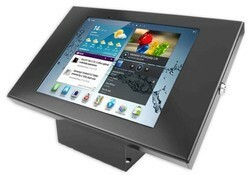 Looking for Desk Mounted Tablet Kiosk Enclosures ?